Cold War Kids – Dear Miss Lonelyhearts | NoCoda. What It Sounds Like: Piano-infused indie rock that takes a blues approach over a pop approach. Nathan Willett is very distinctive in his vocal tone. It’s theatrical, but certainly not forced. It’s warbled, but completely warm. He always sounds like he’s singing in a huge open space, like a cavern, his voice bouncing off the walls and echoing as it floats over some underground lake, in and out of all the cracks and crevices, only to find its way somehow to some recording equipment tucked away in some isolated corner. All this to say – if Mr. Willett ever made a solo record, I would certainly pick it up. I’m a fan of this dude’s voice. 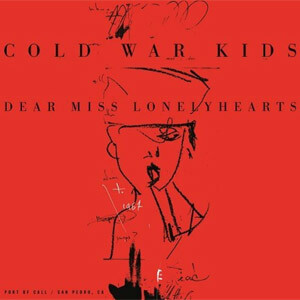 Dear Miss Lonelyhearts is record number four from the Cold War Kids, and really wraps itself up being a perfect hybrid of some of their past work. It’s a return to form in a sense of the Robbers And Cowards days, but with the production simply higher, as it was with the now two-year-old Mine Is Yours. Imagine if their debut record was more produced, and didn’t have quite the grit of anything like Hang Me Up To Dry, and you’ll have a good idea of this record’s offerings. It’s a smart call. I liked Mine Is Yours, but it was a drastic change in sound, more than likely because it was produced by none other than Jacquire King, who did a trio of records (Aha Shake Heartbreak, Only By The Night, Come Around Sundown) for a little band called Kings Of Leon. Use Somebody won him a Grammy the previous year. Think he was trying to repeat his success with the Cold War Kids? You better freaking believe he was. These guys are more suited for the hybrid style they bring us on this 2013 release. Lost That Easy, Loner Phase, and Jailbirds (with its sweet piano riff that repeats through most of the song) pay tribute to their debut, while introducing just the slightest amount of electronic beats to show that they’re evolving, but keeping their soul intact. Fear And Trembling (taking its name from the famous Soren Kierkegaard work) gets extremely loose at the end, morphing into a wall of sound – saxaphone and all. Lead single Miracle Mile sounds nothing like the rest of the record, as it’s a upbeat, happy, sunny, full steam ahead indie anthem. It’s a great song, but for the overall record, it’s misleading. There are certainly the standouts, while the two longest songs on the record come at the very end (Dear Miss Lonelyhearts and Bitter Poem), and both at a surprisingly slow pace down that bring the record to a bare crawl. They’re listenable, but don’t add anything to leave us on a good note wishing for record number five. The pros outweigh the cons, however. My favorite moment on the record comes at the finale of Water And Power, where Nathan victoriously makes an urgent request of us: What you hiding from? You could be fighting, come on! Cold War Kids march on, not straying too far from their roots, but evolving on a micro scale for being four records in. More could have been done, but it’s enjoyable nevertheless.